Cats hold their own counsel. Independent, solitary, even mysterious, they’ve long fascinated their owners with their aloofness. But the very qualities that appeal to their human companions can also make it difficult to tell when they’re sick. One of the most common feline ailments, for example, is heart disease, which affects 10 to 15 percent of cats. All too often, though, the signs are noticed too late. For that reason, Freeman and Tufts veterinary cardiologist John Rush have developed a questionnaire for cat owners and veterinarians to determine how heart disease affects feline quality of life. The survey, known as CATCH (Cats Assessment Tool for Cardiac Health), will be helpful in testing new treatments for heart disease. Studies of humans with heart disease have found a relationship between quality of life and survival rates. In companion animals, where euthanasia is an option, quality of life can help owners make end-of-life decisions about their pets. Studies published in the Journal of Veterinary Internal Medicine in 2010 and the Journal of the American Veterinary Medical Association (JAVMA) in 2008 found that 93 percent of cat owners and 86 percent of dog owners, respectively, would trade a longer life for their pets for a shorter, higher-quality one. Another study by Freeman and other researchers published in JAVMA in 1999 found that 79 percent of dogs that were euthanized were considered by their owners to have had fair or poor quality of life—most likely the case with cat owners as well. Seven years ago, Freeman and Rush helped design another questionnaire to help owners of dogs with heart disease assess their pets’ quality of life. The 18-point canine questionnaire asks owners to identify symptoms—difficulty breathing, coughing and trouble eating and sleeping—as well as behavioral changes, such as less time spent with family and the inability to play fetch. Called FETCH (Functional Evaluation of Cardiac Health), it rates dogs on a scale of 0 to 5—with 0 meaning “not at all” and 5 meaning “very much”—for an overall score of 0 to 65. Adapting the canine questionnaire for cats proved challenging. While some criteria, such as difficulty breathing, could signal heart disease in both cats and dogs, others, such as coughing, is uncommon in cats with cardiac problems. Other behaviors, such as difficulty taking medicine or seeking out solitary locations, could point to cardiac problems in dogs, but are common in healthy cats. Freeman, Rush and their colleagues piloted the questionnaire with owners of 75 cats at three veterinary hospitals: Tufts’ Foster Hospital for Small Animals and hospitals in Pennsylvania and California. After tweaking some of the questions, they administered it to a larger group of 275 cat owners. In the end, the researchers found a close correlation between the results of their survey and the International Small Animal Cardiac Health Council classification for feline heart failure. They published their findings in JAVMA last spring. 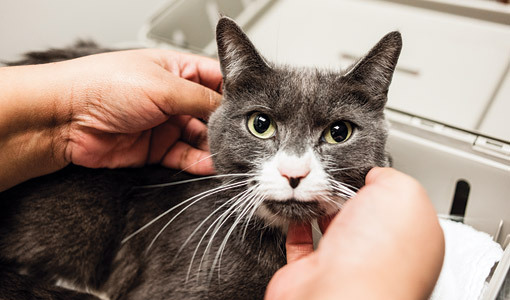 The CATCH score also provided broader information about the general well-being of cats beyond the diagnosis of heart disease—data that could offer a better basis for determining the effectiveness of new drugs and other treatments in clinical trials. “We are really working on better ways to diagnose, prevent and treat heart disease in cats, and this is just one of our tools to get to that goal,” says Freeman. In addition to its benefits for clinical research, Freeman says cat owners could use CATCH to assess overall quality of life in their pets. In fact, the CATCH score might be less important than the questions themselves, which may give owners and their veterinarians a jumping-off point for conversations about the well-being of an animal. “A lot of vets have expressed interest in this because cats are so hard to evaluate,” Freeman says. The CATCH questionnaire may make cats a little less mysterious—at least when it comes to diagnosing heart disease—but no less captivating to owners who care about their pets’ quality of life. For more about clinical trials being conducted at the Cummings School, including how to participate, visit go.tufts.edu/vettrials.